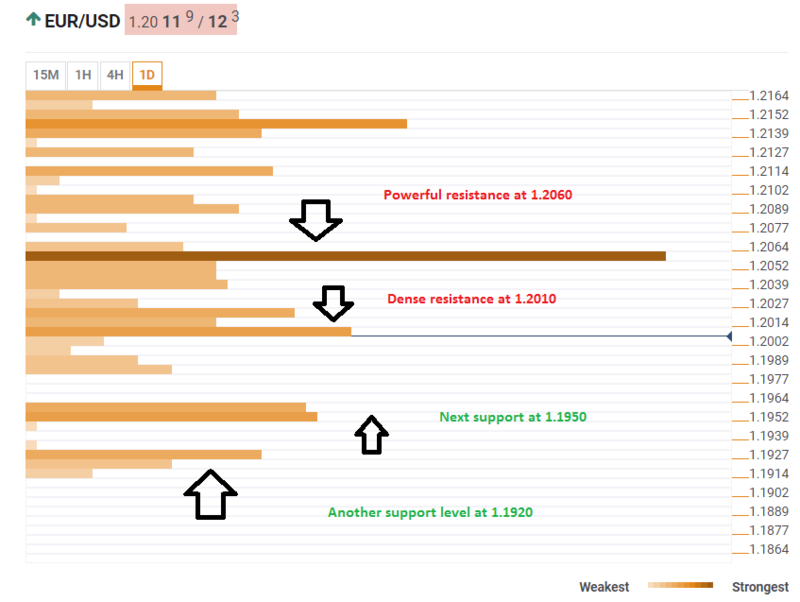 After the EUR/USD plunged below 1.2000, it seems to be attempting a comeback. Will it succeed? The Technical Confluences Indicator shows that the pair faces a dense cluster of resistance lines on the way up. The 1.2010 level is the confluence of the Bolinger Band 15 minute Middle, the BB one-hour Middle, the Simple Moving Average-5-1hv, the Fibonacci 23.6% one-day, and more. If a recovery pushes through this congestion area, the 1.2060 region is already packed with more substantial resistance levels: the SMA50-1h, the one-month low, the one-week low, the Pivot Point one-day R1, and more. On the downside, the 1.1950 area is the confluence level of the Pivot Point one-day S1 and the Pivot Point one-month S1. Even lower, 1.1920 is the PP one-day S2. All in all, there is more upside resistance than downside support.